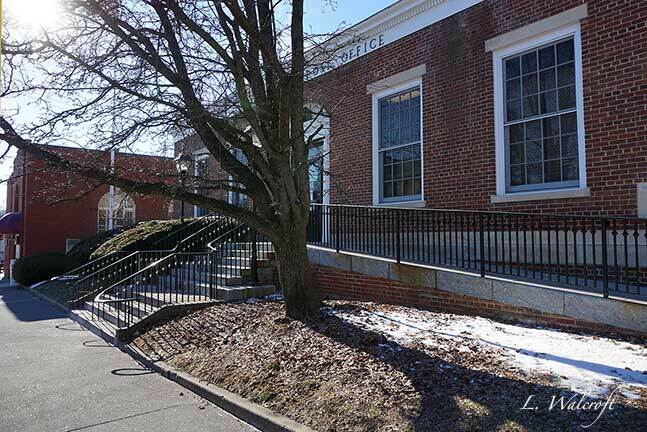 Berryville, Virginia: This "New Deal" post office mural dates to 1939. Painted by artist Edwin Lewis, it depicts some of the agricultural wealth of Clarke County. Even 80 years after this was painted, the county is still known for ranches and farms. The post office reminds me of others of that era, a little old fashioned but tidy and efficient. It is on Church Street across from the court house. On the edge of Berryville, I saw a sign for a Wedding Barn under construction so I took a look. 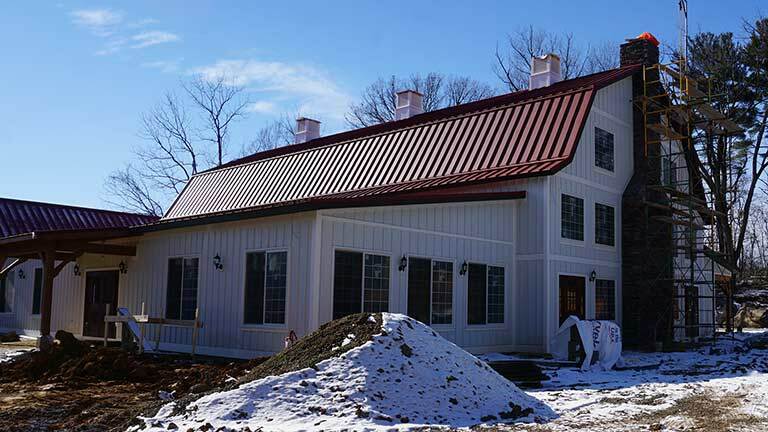 It's an Amish-built barn that is scheduled to open as a wedding venue this spring. It is part of the Rosemont estate. 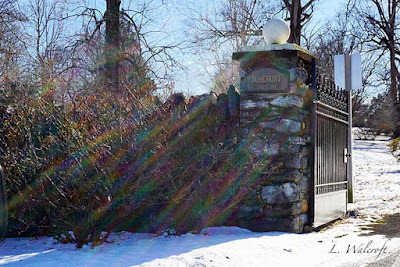 I grabbed a shot of the main gate at Rosemont, which we visited in December 2017. (See previous post about Rosemont.) Yes, I broke the rule about shooting toward the sun. I love breaking that rule! Muito interessante este posto de correios, aproveito para desejar uma boa semana. The last photo id do nice!!!! I like that mural and I like the old fashioned post office. More and more I see barns with signs to rent for weddings. I don't think the barn weddings have slowed much. Not many weddings I see in churches these days. Beautiful old post office and nice rural mural. Thanks Linda. I'm glad you broke the rules -- the sunbeams are gorgeous. 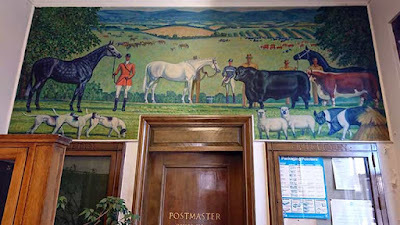 That post office mural is also pretty neat. The PO boxes remind me of the ones in the post office in my little home town. Great mural and gate as well. I do like that mural! ...Berryville looks like my kind of place. We have a few old office offices like this one locally. Thanks Linda for sharing, enjoy your week. 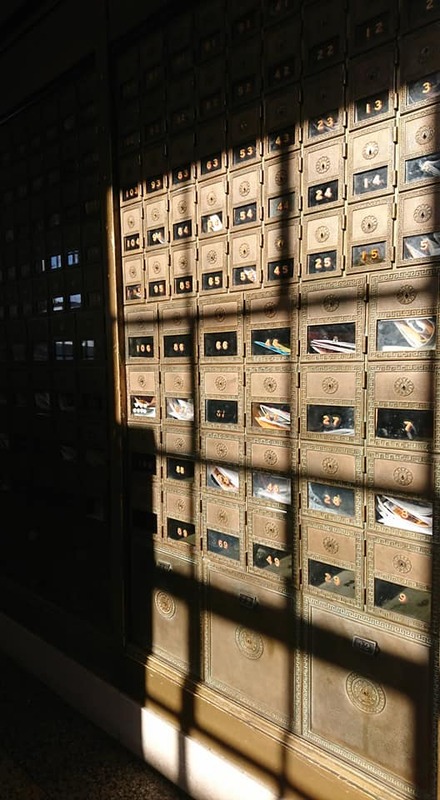 Beautiful, historic place - love the old post office and amazing sun-shot! The sun rays on the gate are great! Hee hee. You can just break rules any time. A barn wedding, first I've heard of it. But then, my generation isn't getting married much these days. 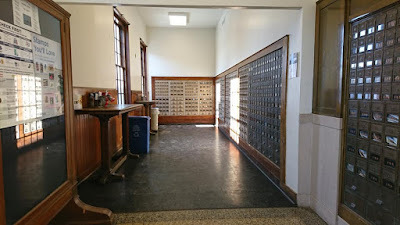 Linda - our post office looks a bit like this, just without the mural! 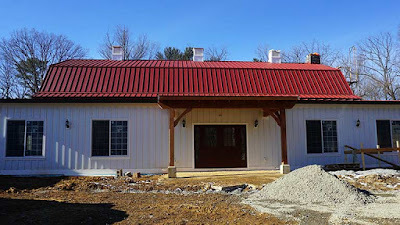 Funny you should mention a Wedding Barn in your post; a neighbor of mine just told me on Sunday she has considered running one as a business - the term was new to me! And now I see it again! That's a neat mural. The post office looks very much like some others that I've seen.